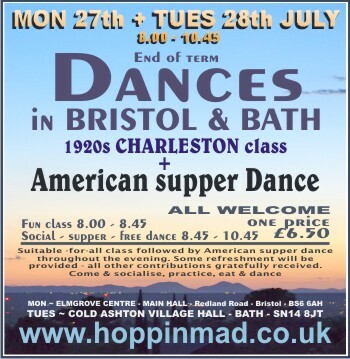 Apart from our regular weekly Swing Dance classes in Bath and Bristol, we run frequent weekend workshops dances and events - Check out our forthcoming events below. 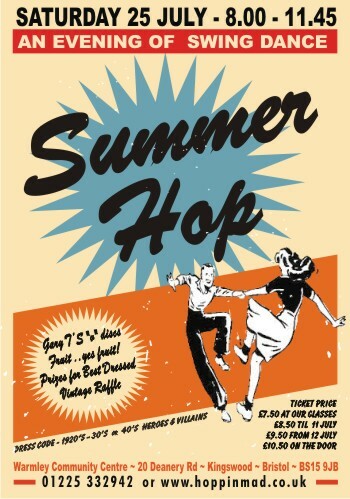 Have you been fascinated by this dance called Lindy Hop but afraid to try it? 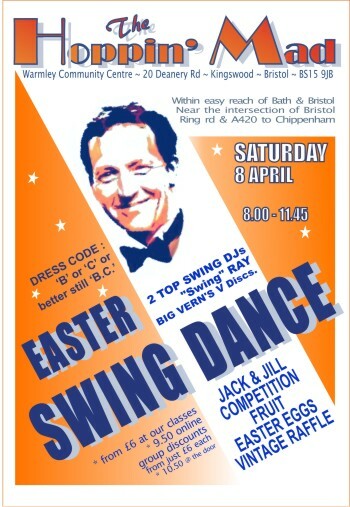 - Ever wondered what Swing Dance is? - Want to get noticed on the dance floor? Tried other dances but want to look more flashy? Want to be the coolest person in the room at parties? Then these workshops are for you. ARE THESE WORKSHOPS SUITABLE FOR ME? Which classes are you booking? ARE THESE CLASSES SUITABLE FOR ME ? 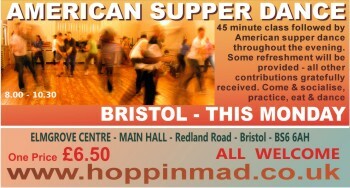 Welcome to our first swing dance workshops in Taunton. The first two classes are for total beginners and will work as a pair of classes so will be suitable for anyone. More advanced dancers may like to use these as a warm-up and reminder of the basics. 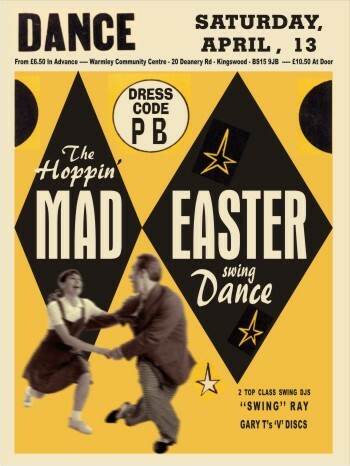 The 3rd and 4th Classes are definitely aimed at dancers who have some experience of Swing dance &would be aware of 6-beat, 8-beat & Charleston rhythms. moves to your repertoire. 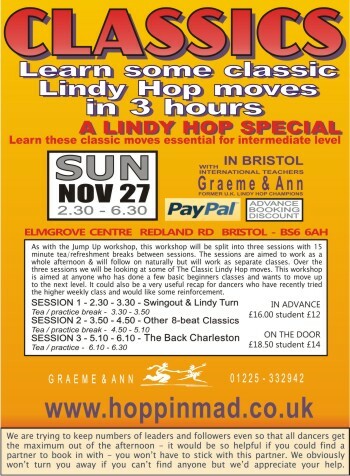 We will be looking at Lindy Turns as part of this session. 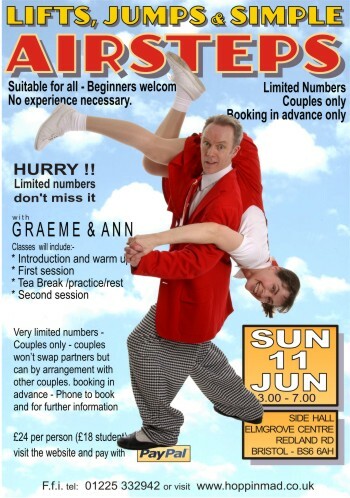 Ideal if youve done a few weekly beginners classes & want to move into the second class. A second class looking at how the 8 beat timing can open up more possibilities, extend moves & give a further chance to add some flash to your Lindy. 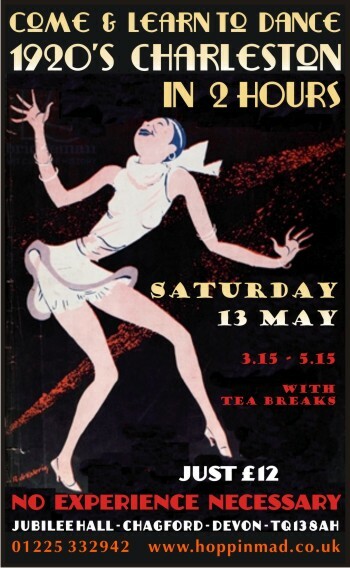 Well be looking at some more classic Lindy Hop shapes in this session. Another class to bridge the gap between beginners and improvers/intermediate. SESSION 3 - 5.45 - 6.45 "WEDNESDAY NIGHT HOP - first part " These last two sessions will be spent learning this whole sequence - you will need to book in for both sessions. This classic sequence was choreographed by the legendary Frankie Manning. 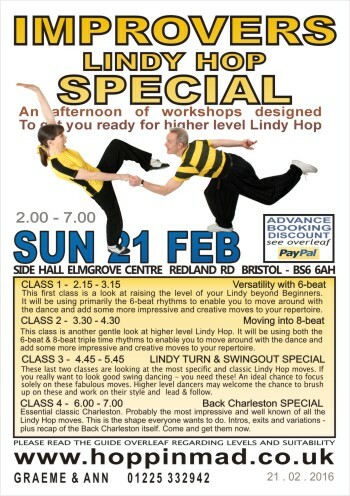 A great chance to learn some fabulous Lindy that you can either dip into or pull out as a whole impressive choreography. 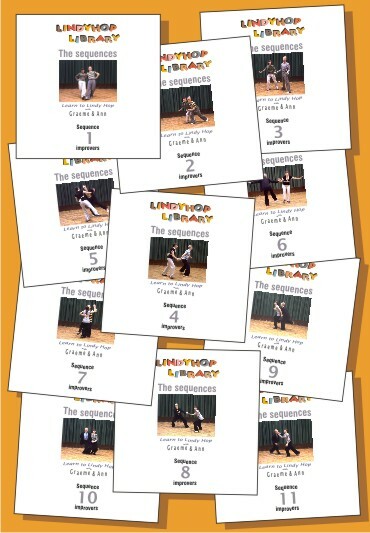 It is not a highly complex sequence but there are quite a lot of moves, some of which are standard Lindy Hop shapes. SESSION 4 - 7.00 - 8.00 "WEDNESDAY NIGHT HOP - 2nd part "
This workshop will be split into three sessions with 15 minute tea/refreshment breaks between sessions. The sessions are aimed to work as a whole afternoon & will follow on naturally but will work as separate classes. Over the three sessions we aim to cover all the absolute essentials you will need to be ready for our weekly Intermediate/higher level classes. 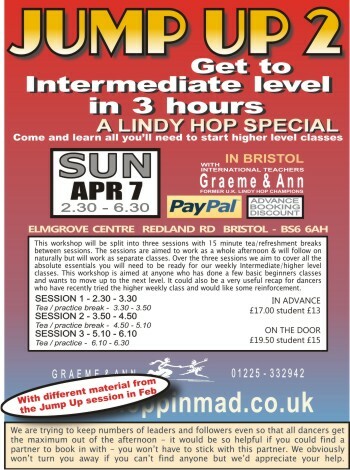 This workshop is aimed at anyone who has done a few basic beginners classes and wants to move up to the next level. It could also be a very useful recap for dancers who have recently tried the higher weekly class and would like some reinforcement. 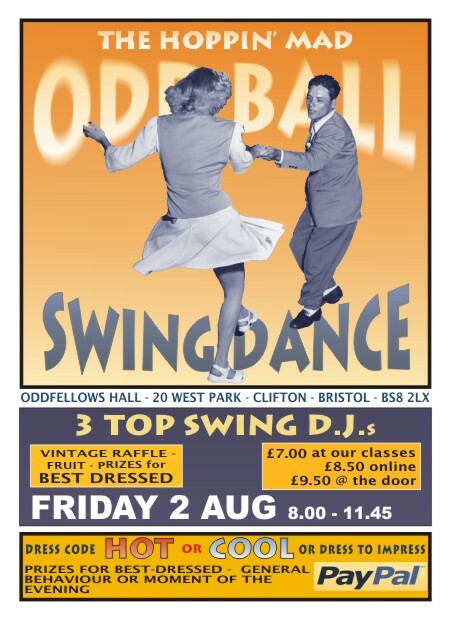 DRESS CODE - VINTAGE - or P.B..
Add another fun Charleston routine to your repertoire. 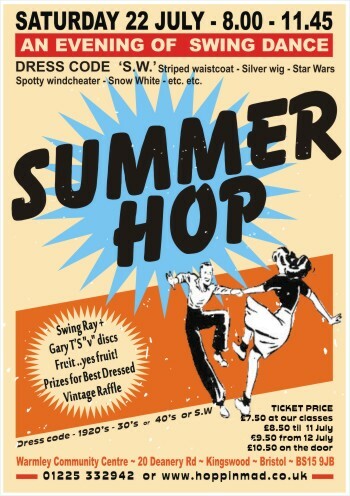 Charlestons in Lindy Hop are great for dancing to more up tempo music. We will work on a sequence using basic Charlestons with more interesting transitions and variations. Useful to know jockey, Back & Opposite Charlestons. THESE TWO CLASSES ARE AIMED AT GOOD BEGINNERS WHO WANT TO PUSH THEIR DANCING, IMPROVERS AND DANCERS WHO WOULD LIKE SOME RECAP. In this workshop we will be putting together a routine where the aim is twofold. 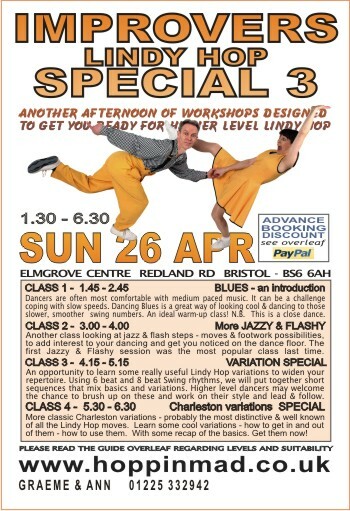 Firstly to learn a good useful all-round routine which will incorporate lots of different elements of Lindy Hop. Secondly to dance this routine to slightly faster music and to look at the problems and considerations of dancing at a faster pace. . The routine will be Intermediate level. 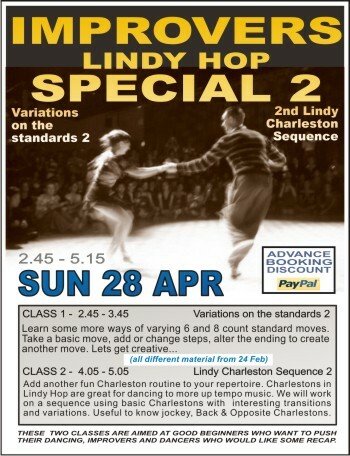 As a guide you should know 6-beat, 8-beat and Charleston rhythms as well as Swingouts, Lindy Turns, Lindy circle, and Back Charleston, Opposite Charleston etc. if there is enough interest - we hope that the routine will form the basis of a future performance. 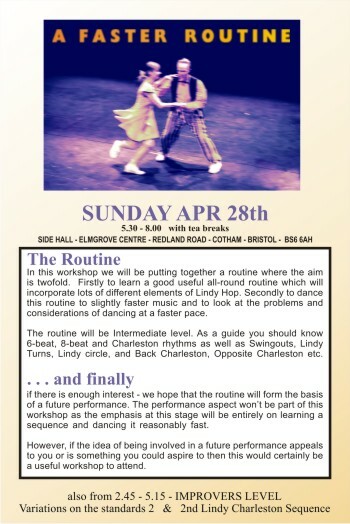 The performance aspect wont be part of this workshop as the emphasis at this stage will be entirely on learning a sequence and dancing it reasonably fast. . However, if the idea of being involved in a future performance appeals to you or is something you could aspire to then this would certainly be a useful workshop to attend. . 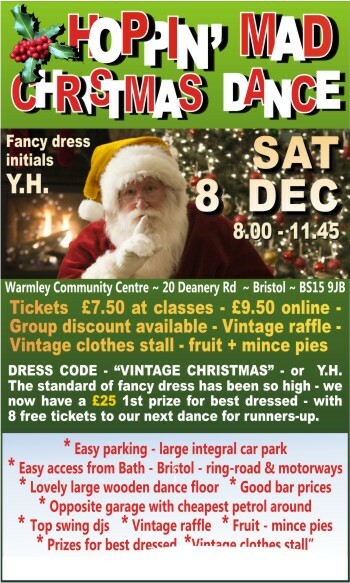 DRESS CODE - VINTAGE CHRISTMAS - or Y.H. Near the intersection of A420 + A46. 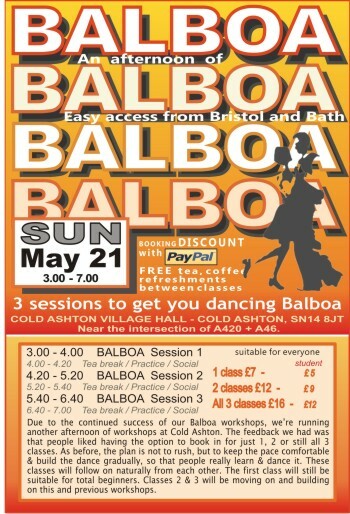 Due to the continued success of our Balboa workshops, were running another afternoon of workshops at Cold Ashton. The feedback we had was that people liked having the option to book in for just 1, 2 or still all 3 classes. As before, the plan is not to rush, but to keep the pace comfortable & build the dance gradually, so that people really learn & dance it. These classes will follow on naturally from each other. The first class will still be suitable for total beginners. Classes 2 & 3 will be moving on and building on this and previous workshops. * Booking in advance advised! DRESS CODE - RED or better still - "VINTAGE RED" - be inventive! As with our previous workshops, this workshop will be split into three sessions with 15 minute tea/refreshment breaks between sessions. The sessions are aimed to work as a whole afternoon and will follow on naturally but will also work as separate classes. 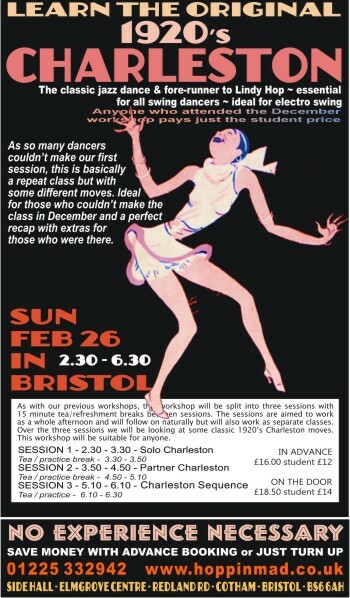 Over the three sessions we will be looking at some classic 1920s Charleston moves. This workshop will be suitable for anyone. 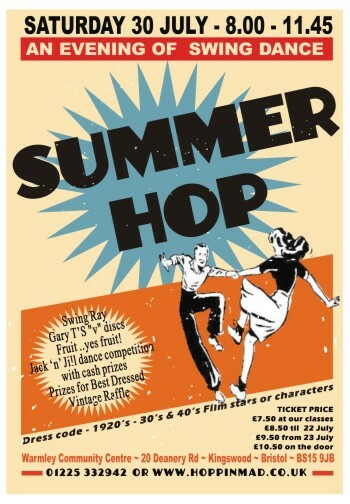 DONE A BIT OF LINDY HOP ? CAN'T REMEMBER A THING WHEN YOU GET ON THE DANCE FLOOR ? Weve put together these 11 MINI ROUTINES with you in mind. Each of these sequences is between 8 and 12 bars of 8 beats. The most common cry we hear is -  I can cope with classes - but I cant put a thing together when I get on the dance floor  Each mini routine is shown to music - broken down and explained with lead / follow & style points and tips - and then slowed down so you get a good clear look at the swing motion.